A brilliant virtuoso of violence, Richard Marcinko rose through Navy ranks to create and command one of this country's most elite and classified counterterrorist units, SEAL TEAM SIX. Now this thirty-year veteran recounts the secret missions and Special Warfare madness of his worldwide military career -- and the riveting truth about the top-secret Navy SEALs. jungle. For the Pentagon, he organized the Navy's first counterterrorist unit: the legendary SEAL TEAM SIX, which went on classified missions from Central America to the Middle East, the North Sea, Africa and beyond. Then Marcinko was tapped to create Red Cell, a dirty-dozen team of the military's most accomplished and decorated counterterrorists. Their unbelievable job was to test the defenses of the Navy's most secure facilities and installations. The result was predictable: all hell broke loose. Here is the hero who saw beyond the blood to ultimate justice -- and the decorated warrior who became such a maverick that the Navy brass wanted his head on a pole, and for a time, got it. 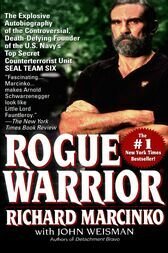 Richard Marcinko -- ROGUE WARRIOR.